If you happen to invest in companies on the stock market, you probably own quite a lot of shares. 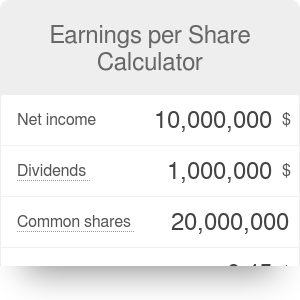 With the use of this earnings per share calculator, you will be able to assess their real value in just a few clicks. This tool will teach you how to calculate your earnings per share and provide you with a foolproof EPS formula. The earnings per share (EPS) is the portion of company's total profit allocated to each of the shares held by the company's shareholders. It is one of the most important variables used to determine the profitability of investing in a given stock. One of the ways to make an informed investment decision is to compare the EPS figures for one company over a long time period. You can also compare EPS values for a few companies within the same industry to choose the most profitable one. Earnings per share take into account common stock only; the preferred stock has no influence on the value of the shares. Net income: total earnings (profit) of the company, calculated as the costs subtracted from the total revenue. Dividends on preferred stock: preferred stock is a class of assets that gives the shareholders priority over the common stock. Even though preferred shares give a higher yield and are more secure (in the case of company liquidation, these shareholders receive money first), they don't carry voting rights. Dividends on preferred stock are simply the monthly or quarterly payments obtained by the shareholders. Average outstanding common shares: the number of shares currently held by the shareholders. This number usually fluctuates over time - for example, it increases when the company issues additional shares and decreases when it buys back its shares. Determine the net income of the company. Let's assume that it is equal to $3.12 billion. Calculate the total sum of dividends on preferred stock. We can assume it is equal to $200 million. Determine the number of outstanding common shares for this company. We can choose a number of 333.4 million. The EPS value is commonly used in the discounted cash flow method of company valuation or in the P/E ratio. Earnings per Share Calculator can be embedded on your website to enrich the content you wrote and make it easier for your visitors to understand your message.